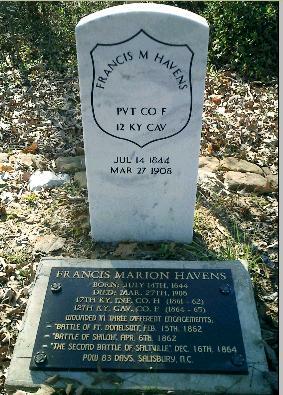 Francis Havens is listed in the adjutant General's Report on page 974 under Company H Discharged as Franklin Haven, being enrolled on 27 October 1861, and mustered in at Calhoun on January 4, 1862 for a three-year enlistment. The remarks says, "discharged August 29, 1862 at Louisville, Kentucky." His great great grandson, Barry Goodall writes, "... Wounded first at the Battle of Fort Donelson with a gunshot to the stomach. The mini-ball impacted on his cartridge belt plate, folding it in half. Wounded again on April 6, 1862 with the loss of his right eye. Medical discharge Aug. 20, 1862. Enlisted in the 12th Kentucky Cavalry Feb. 20, 1864. 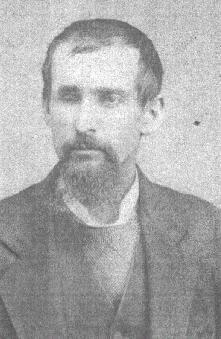 Wounded for the third time and captured Dec. 16, 1864 outside Marion VA. Spent 83 days in captivity at Salisbury Prison NC. Paroled March 8, 1865 at Wilmington NC. Reunited with the 12th Kentucky Cavalry at Nashville TN early August 1865. 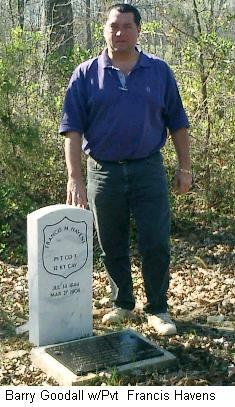 Mustered out of the of the 12th Kentucky Cavalry with the remainder of the regiment at Louisville KY on Aug. 23, 1865." Our thanks to Barry Goodall for providing the informatin and for the phtograph of Private Havens. You may read the entire article to include details of Mr. Goodall's search of the records of his ancestor's pension, and the location, marking, and dedication of his grave by reenactors of the 12th Cavalry, by going to the News page and searching on the document ID.